I have to tell you that I absolutely LOVE this image. 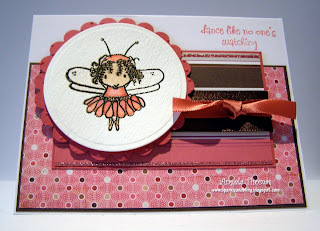 The Huggabuggs from Stamping Bella are just so incredibly cute. I've wanted this one for a long time, finally got it but then it hasn't seen ink yet. When I saw today's challenge on the Mojo Monday blog I knew I had to go for it. I haven't made an A2 card in quite awhile but it definitely worked with this sketch. One of my friends got me addicted to making square cards (gotta love all the space). I found the striped designer paper ages ago at a LSS and have been hoarding it until just the right card. It works so well with the Basic Grey Bittersweet line. I've added Angel Wings Shimmerz to Twinkletoes' wings for a bit of shine. Always loving my sparkle and bling! "miss you guys in Nanaimo"
This is the cutiest little image! FABULOUS card. I can spill the beans!!! !